I have a certificate that has to be imported into Certificates/Trusted Root Certification Authorities and has a corresponding private key. To actually access the key from code you need to set private key permissions to grant full access to particular IIS application pool. I totally understand that but the problem is that this can only be set on personal certificates and not trusted root ones. If I set my application pools identity to Local System (which has total permissions over my machine) I can successfully access private key. So the main question is how do I set permissions on my application pool identity to have access to private keys for certificates in the Trusted Root store. Why trusted root store and not personal? I have a pre-built assembly that accesses this certificate in this particular store, so simply placing the certificate in Personal store won't do the trick for me. That's why setting trust permissions on private keys of trusted root certificates is imperative. I haven't tried this with the Trusted Root Certification Authorities but what I have found is the simplest thing to do with other Certificate Stores is to drag and drop the certificate into the Personal Store and then set permissions and then drag and drop back to the original certificate store. In your case the Trusted Root Certification Authorities. Drag and drop the imported cert to the Personal Store. Right click the certificate in the Personal Store and in the context menu, click "All Tasks", then in the submenu click on "Manage Private Keys". Set the appropriate permissions according to your app pool as referenced in step 1. After permissions have been set, drag and drop the certificate back to the original store (in your case the Trusted Root Certification Authorities). It is possible to set trust permissions on certificates other than those in Personal certificate store, but you can't set permissions via MMC. At least not directly on the store that is. Accepted answer shows a simplified approach with moving certificates around to achieve the same result. Open in Visual Studio and compile it. Open MMC and add Certificates snap-in. Make sure you select Computer and Local Machine when adding it. Select the store that has your certificate with private key. This will grant certificate private key full trust to your user (in my case above it's application pool identity) so you can use the key to sign data or do whatever you need to do with it. In case you don't want full permissions, you can easily change the last part after colon. It can have many different settings, so I urge you to check icacls command help. If you are using Windows Server 2003, you'll notice that you don't get the Manage Private Keys task under your certificate. 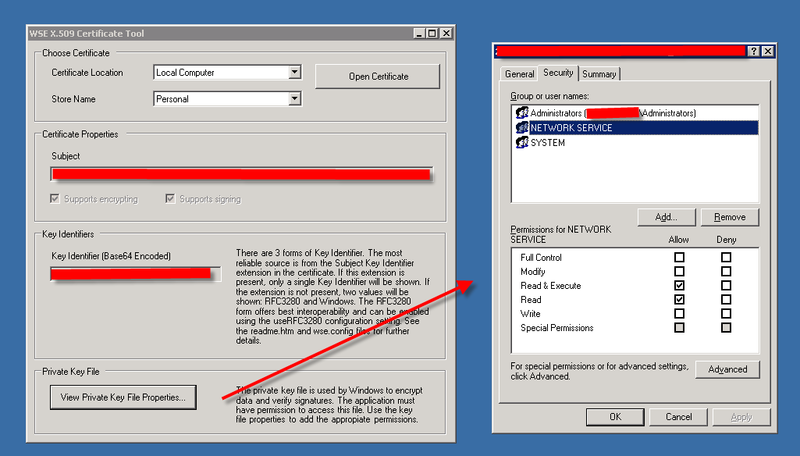 If you install Microsoft WSE 2.0 on to your machine, you can use a tool called X509 Certificate Tool. Just search for your cert, its more than likely in (or should be) in Local Machine / Personal Store. NOTE: if you have your cert in Current User / Personal Store (which often is the default), it will only be accessible to the user that is currently logged in, which means if you want your webserver to access it, it can't without changing permissions to your AppPool. You should be able to change the permissions to the private key very easily, by default, your AppPool on your webserver will be using NETWORK SERVICE to run your web application. So just add NETWORK SERVICE to the security and by default it will set the Read and Read / Execute permissions which is sufficient for your BouncyCastle, etc, to read the private key so you can sign your document. Not the answer you're looking for? Browse other questions tagged windows-7 iis-7 certificate windows-server-2008-r2 private-key or ask your own question. How to give certificate in personal store full trust? Can an X509Certificate be fetched from the certificates store by ASP.NET without file-system permissions? Is there a way to make Java trust a certificate if it is in Windows trusted certificates list?